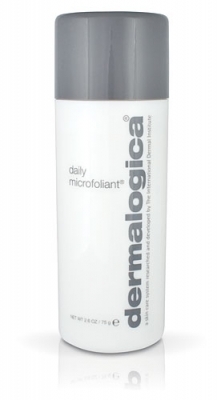 Dermalogica Daily Microfoliant - There is beautiful skin awaiting underneath our current layer of skin. It is asking to be brought to the surface! This is where exfoliation helps us out with bringing it to the surface. Exfoliating on a consistent basis helps our moisturizers and lotions work better on our face. Most products can only be used once to maybe twice a week. Dermalogica has come up with an exfoliating products that can be used everyday. The Daily Microfoliant is a rice based enzyme powder that activates on contact with water. The rice based enzyme helps loosen dead skin cells. It also contains salicylic acid which helps with acne. And licorice which helps with evening out skin pigmentation. Microcrystalline Cellulose, Magnesium Silicate, Sodium Cocoyl Idethionate, Disodiom Lauryl, Sulfosuccinate, Sodium Lauroyl Glutamate, Collodidal Oatmeal, Oryza Sativa Bran, Oryza Sativa Starch, Oryza Sativa Extract, Papain, Salucylic Acid, Aspergillus, Ferment; Extracts Of: Arctostphylos Uva Ursi Leaf, Glycyrrhiza Glabra, Citrus Grandis Fruit, Camellia Sinensis Leaf, Ginkgo Biloba, Allantoin, Hydrolyzed Wheat Protein; Essential Oils Of: Melameuca Alternifolia Leaf, Citrus Grandis Peel, PCA, Cyclodextrin, Allyl Methacrylates, Crosspolymer, Titanium Dioxide, Methylparaben. Cleanse your face and remove your makeup. Pour out a tiny bit of powder and message it into your face with water. Rinse with water and feel the difference. "Actually cleared up by skin for the first time in ages." "My s kin is smoother, brighter, and free of acne since I have started using this products." "I have super sensitive skin and could not use anything until I found this product." "This product is truly a miracle for my skin."